Miami Beach 411 > Hotels > 3-star > Park Central Hotel in Miami Beach, FL. ¿Hablas Español? ABOVE: two guys do a funny dance inside their room at Park Central. Watch more hotel videos. This page allows you to watch a video, find directions, post a comment, read reviews, and check rates at the Park Central Hotel. Rates: Low season from $125. High season from $175. 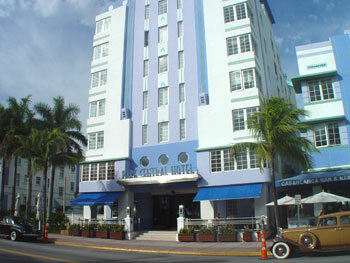 The Park Central 3-Star Hotel is located in South Beach across from the ocean, and two miles from downtown Miami. The Hotel has 115 guest rooms and 12 suites, many with ocean views. Custom made furtiture evokes the hotels history while modern amenities such as: an open-air sculpture garden, rooftop garden deck, outdoor pool, and fitness room, ensure that you have everything you need for a comfortable stay. Two restaurants are on site, as is a five-station hair and makeup area. Complimentary morning coffee and tea are provided, and concierge and business services are available. Complimentary wireless Internet access (Wi-Fi connections) is available throughout the hotel and guest rooms. Click HERE for Park Central Lodging Information. • The Park Central is on the Left (West) side of the street. Park Central is located at 640 Ocean Dr., Miami Beach, FL 33139. Use our Miami hotel map to find the exact location. Park Central "Not what I had expected, yet not horrible"
ahead and stay here. The place is okay, just not what I expected. Park Central "More bang for your buck"
I've stayed at my fair share of, "Fairmonts", and other 5 stars, so I am not easily impressed when it comes to hotels. "Park Central", has all the amentities needed for a nice getaway. They provide an inroom safe, cotton robes, a pool, albeit small, and sundeck, not to mention a walk across the street to the padded chaises they provide free of charge on the beach. It's a block from the where the SoBe action begins, so it's nice and quiet, while still being centrally located. 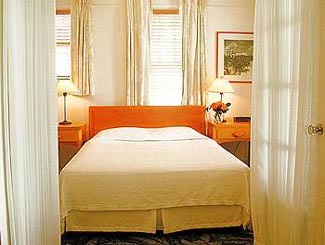 The rooms are small, but the beds are incredible, and the staff is very attentive. Need more convincing? Have the lobster in rum vanilla sauce with their apsparagus and augratin potatoes at their restaurant, "Quinn's". Pricey, but worth every dime. I can't wait to go back! Park Central Hotel in Miami Beach. Miami hotel reservations.